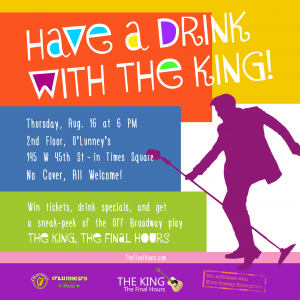 The cast of The King, The Final Hours will perform a few scenes in Times Square tomorrow at the famous O'Lunney's Irish Pub in Times Square. It's a fun opportunity to do something different after work. In addition to getting some free entertainment and meeting the cast, fans will also get to ask the playwright and director questions on the play. From their artistic interpretations to their favorite song, it's open game. O'Lunney's is located on 45th Street between 6th and 7th Avenue. We will be on the second floor. Join us in Midtown at 6pm. It will be fun.